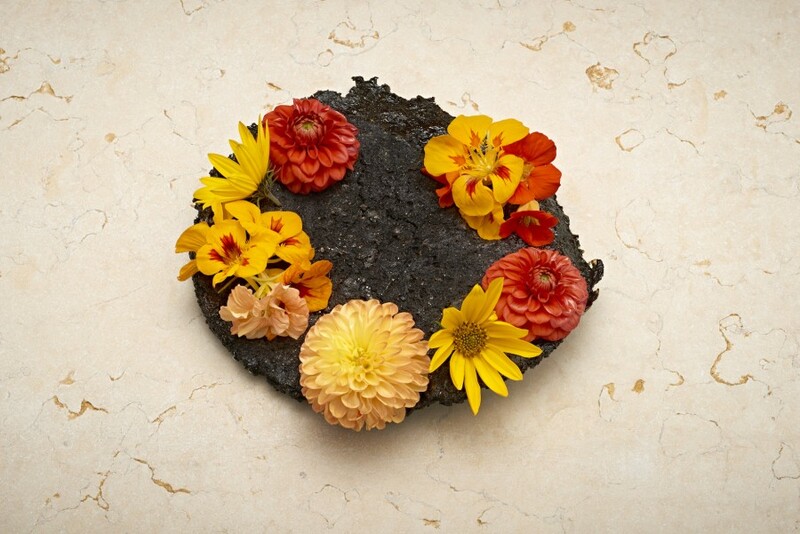 ‘Edible flowers’ from Kristian Baumann (108) served on an organic soil plate by Rebecca Deans. 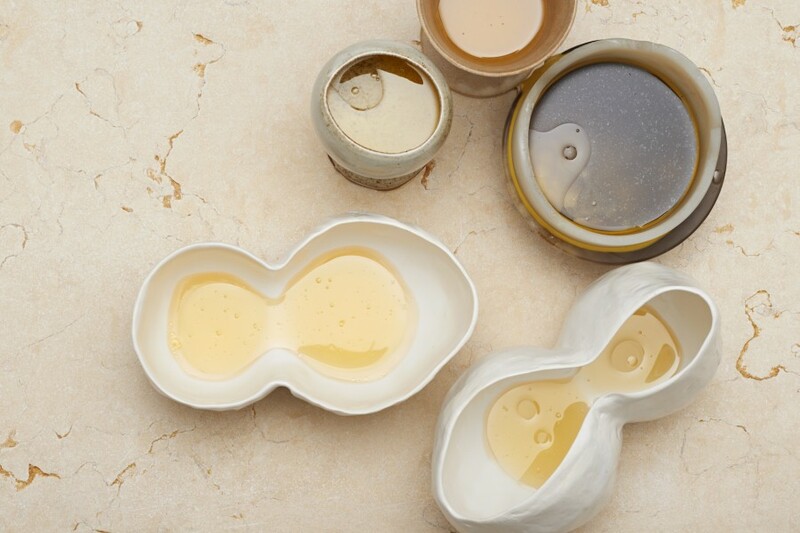 Hazelnut and Walnuts oils served on ‘Organic’ bowls by Gabriela Cohn and ‘Rooftop’ bowls by Julia Obermaier. 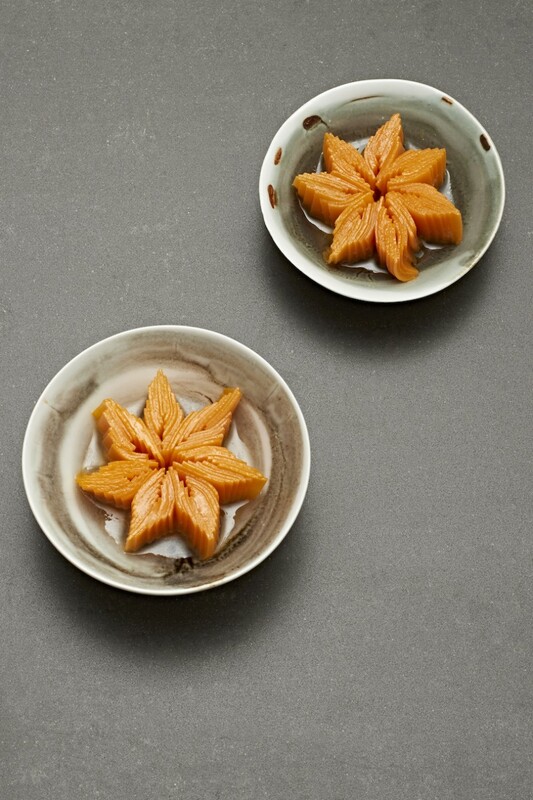 Pumpkin marinated in fresh almond oil from Kristian Baumann (108) served in porcelain bowls by Luo Xinzhe. 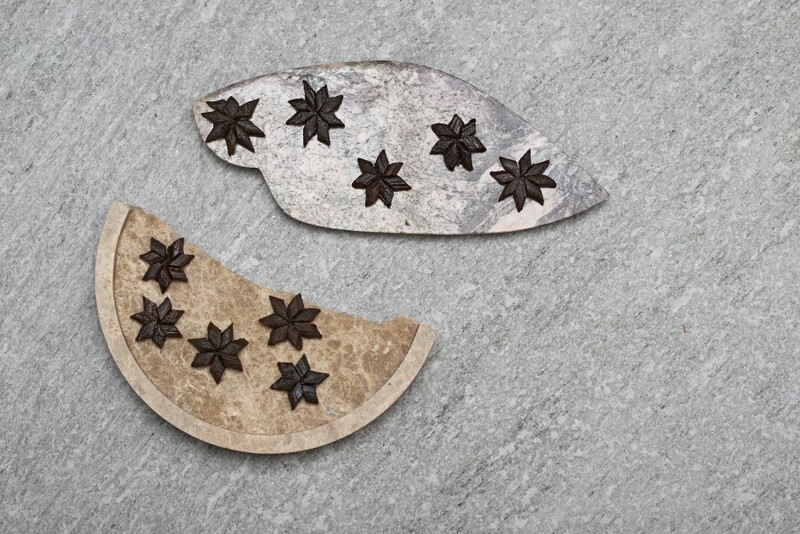 ‘Black Stars’ from Kristian Baumann (108) served on a stone plate by Felicia Mülbaier and a marble plate by Katharina Dettar & Stine Keinicke. 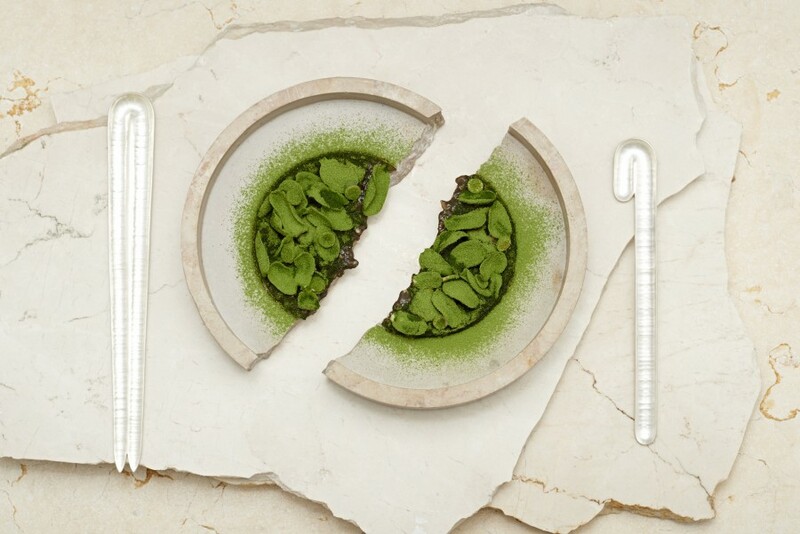 Sliced courgette and salted plums from Kristian Baumann (108) served on ‘Paper Pulp’ plate by Caroline Hultqvist. 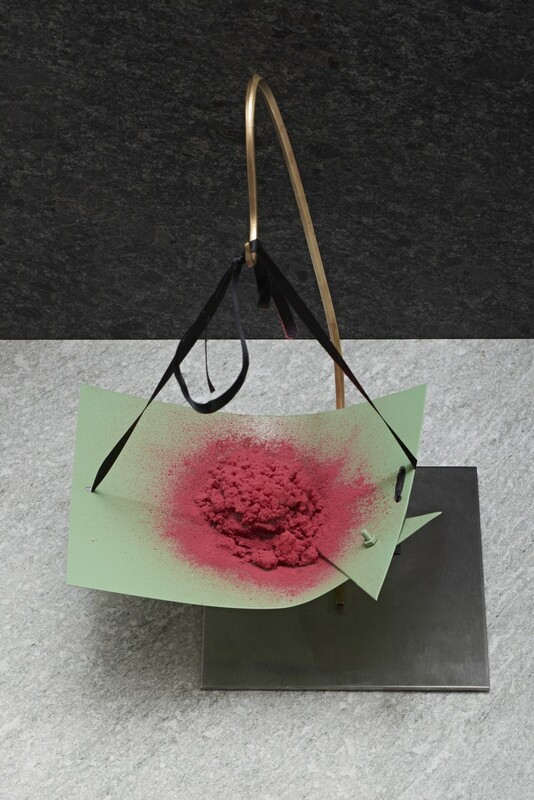 Poached rhubarb and raspberry powder from Kristian Baumann (108) served on a ‘Hanging Basket’ plate by Kathleen Reilly. 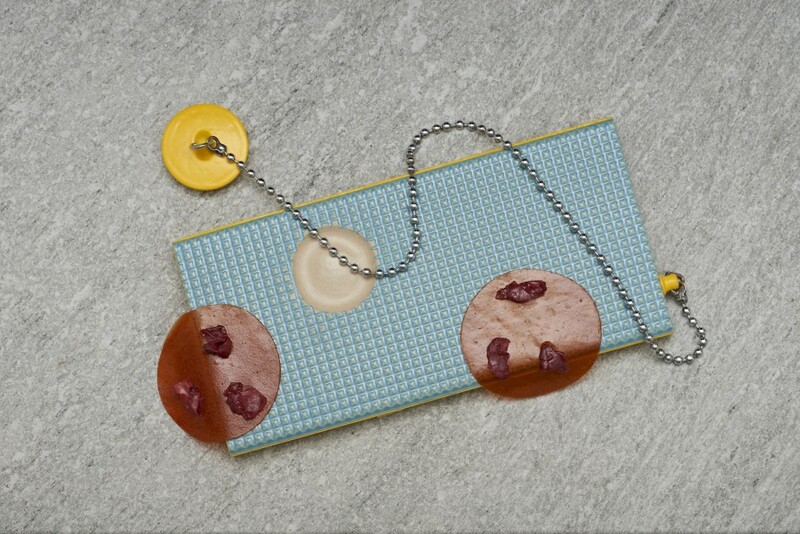 Rosehip leather and pickled roses from Kristian Baumann (108) served on a rubber plug tile plate by Helen Habtay. 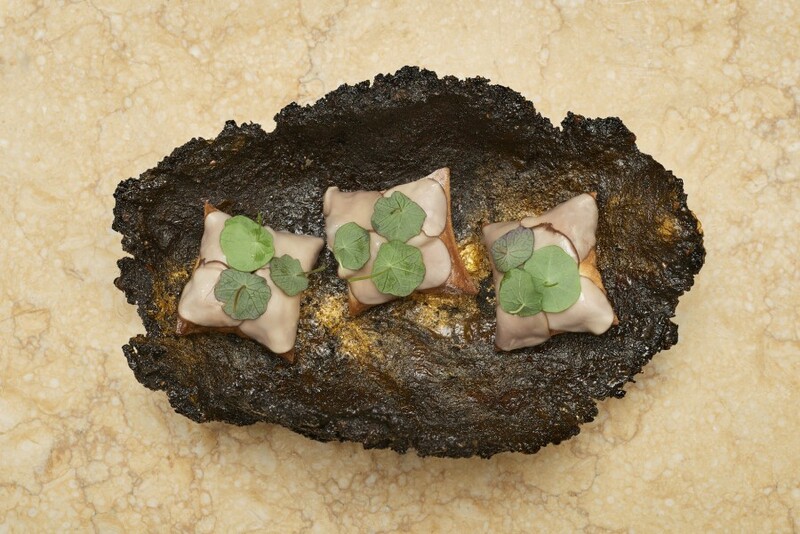 Mushroom pillow from Andreas Rieger (einsunternull) served on an organic soil plate by Rebecca Deans. 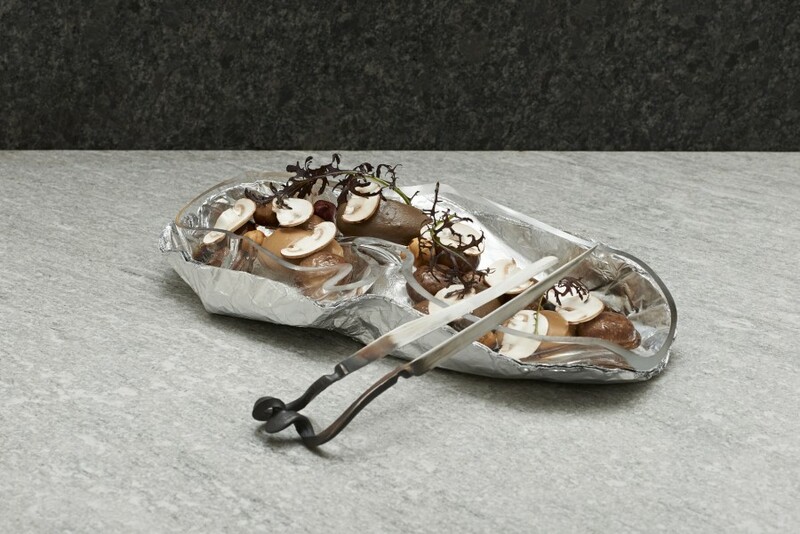 Champignons and hazelnut from Andreas Rieger (einsunternull) served on an aluminium foil glass plate by Dovile Bernadisiute with a folded knife by Nils Hint. 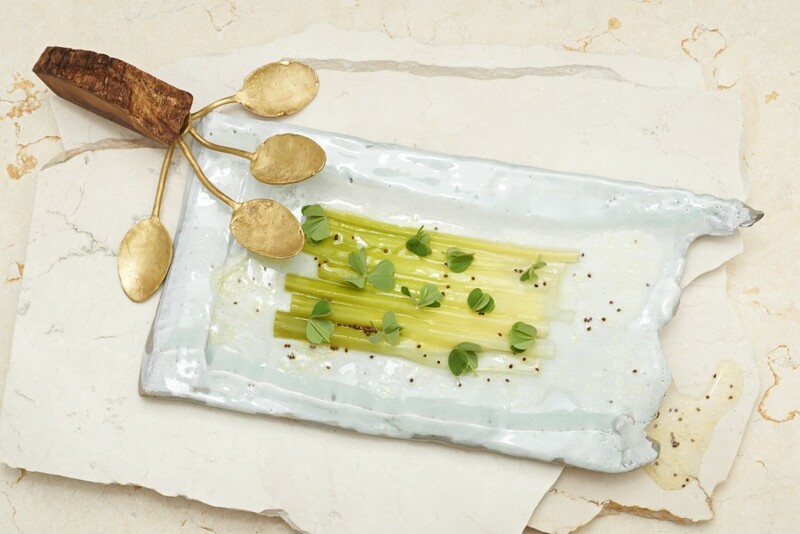 Leek and clover from Andreas Rieger (einsunternull) served on a ceramic block plate by Cathrine Sanke & Annegret Streu with a ‘Playful’ spoon by Laia Ribas Valls. 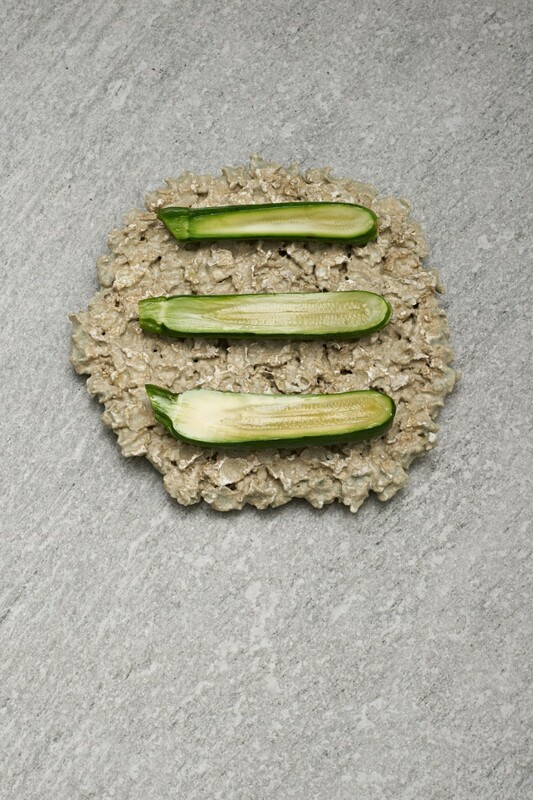 Sunflower seeds, sunchoke and horseradish from Andreas Rieger (einsunternull) served on two grey stone plates by Katharina Dettar & Stine Keinicke with ‘Worm Tracks’ spoons by Sophie Hanagarth. 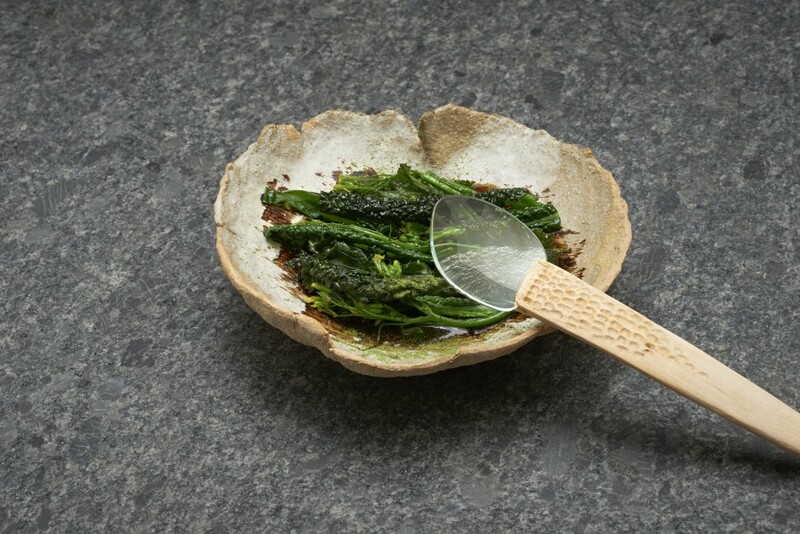 Kale, black garlic and lovage from Andreas Rieger (einsunternull) served on a ripped clay plate by Judith Lasry with an ‘Optic’ spoon by Elin Flognman. 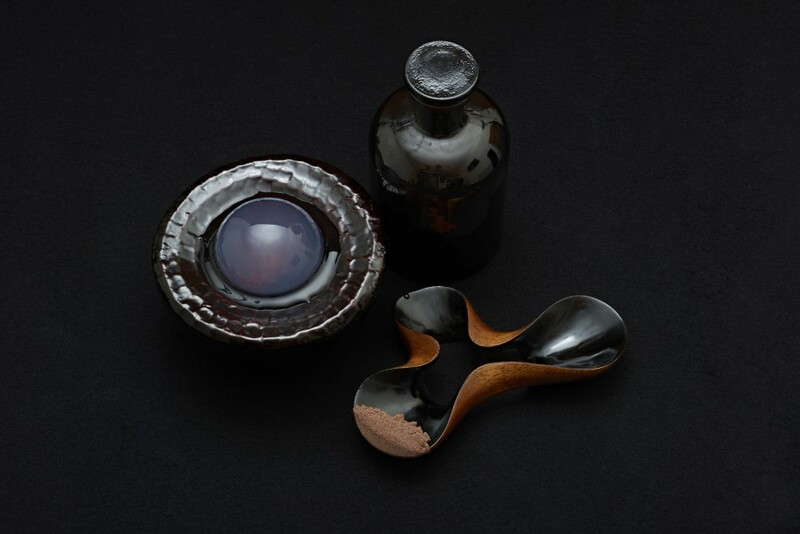 Mizu Shingen Mochi and elderbeery from Andreas Rieger (einsunternull) served on a ‘Tactual’ bowl by Heejoo Kim with a ‘Moment’ spoon by Joo Hyung Park. 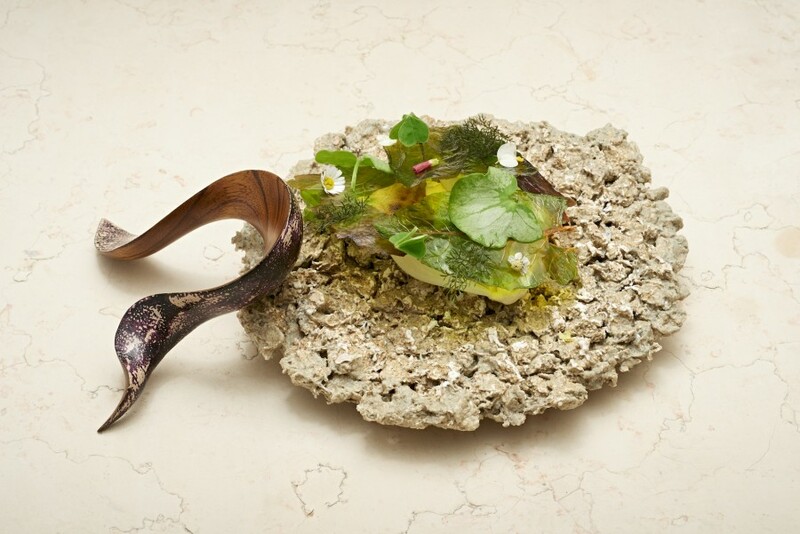 Salad with grape seed oil sorbet, vinegar and oil from Andreas Rieger (einsunternull) served on a ‘Paper Pulp’ plate by Caroline Hultqvist with a ‘Moment’ spoon by Joo Hyung Park. 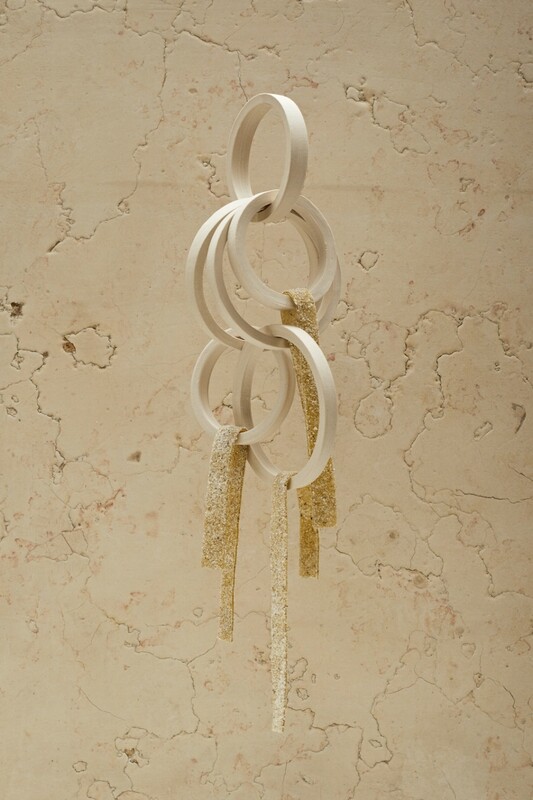 ‘Sour Barrel Cucumber’ loops from Andreas Rieger (einsunternull) served on ceramic rings by Hugo Madureira. 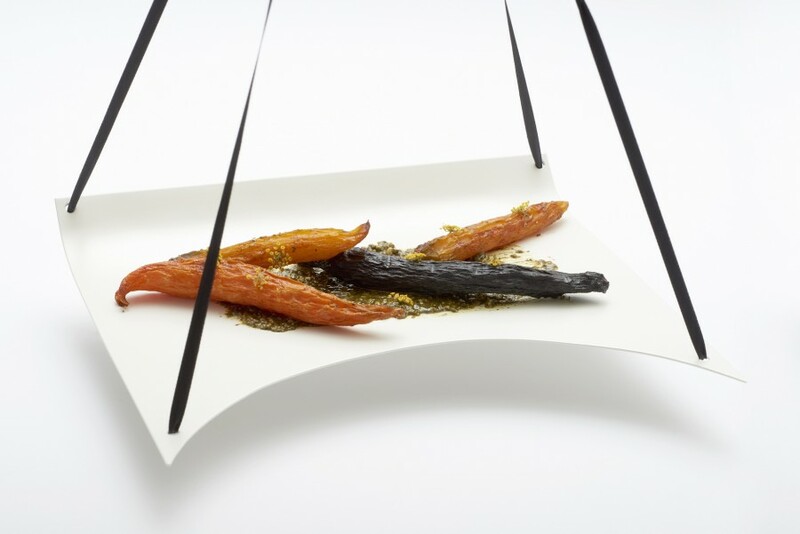 Carrot, pumpkin seeds and fennel pods from Daniel Burns (Luksus) served on a ‘White Bib’ plate by Kathleen Reilly. 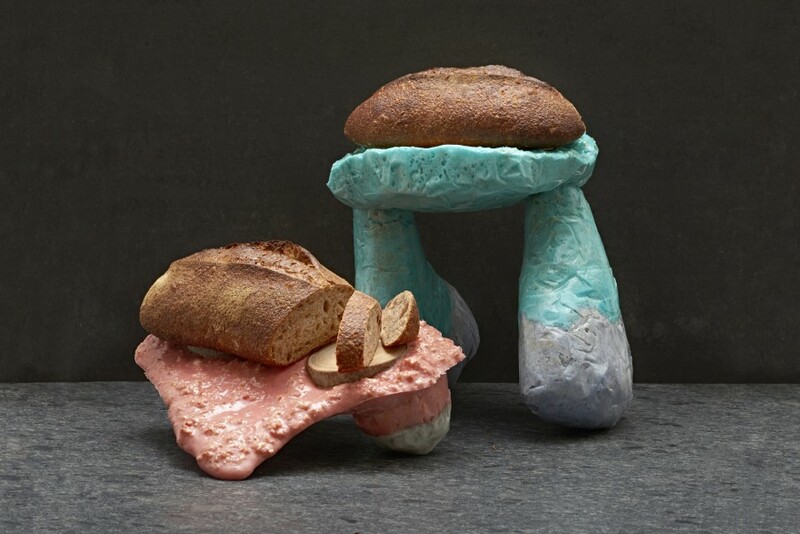 ‘Goldblume’ wheat sourdough bread from Emile van der Staak (De Nieuwe Winkel) served on ‘Dinner Creatures’ by Machteld Lambeets. 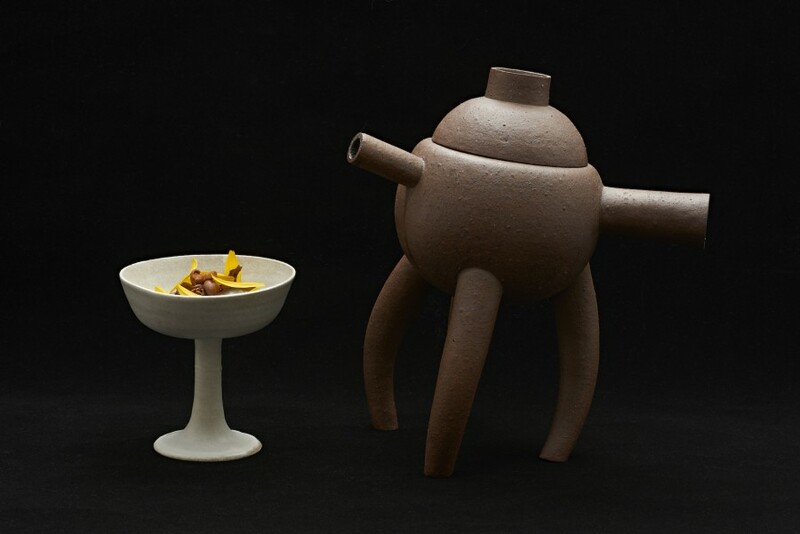 ‘Forest’ from Daniel Burns (Luksus) served on a clay chalice by Gabriela Jimenez Falch and a ‘Broth Pot’ by Tono Perez. 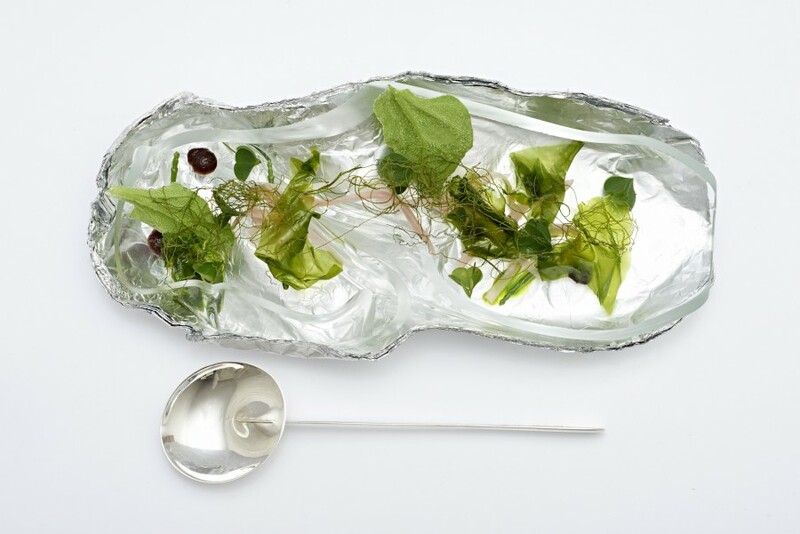 ‘Sea’ from Daniel Burns (Luksus) served on an aluminium foil glass plate by Dovile Bernadisiute with a ‘Moment’ spoon by Joo Hyung Park. 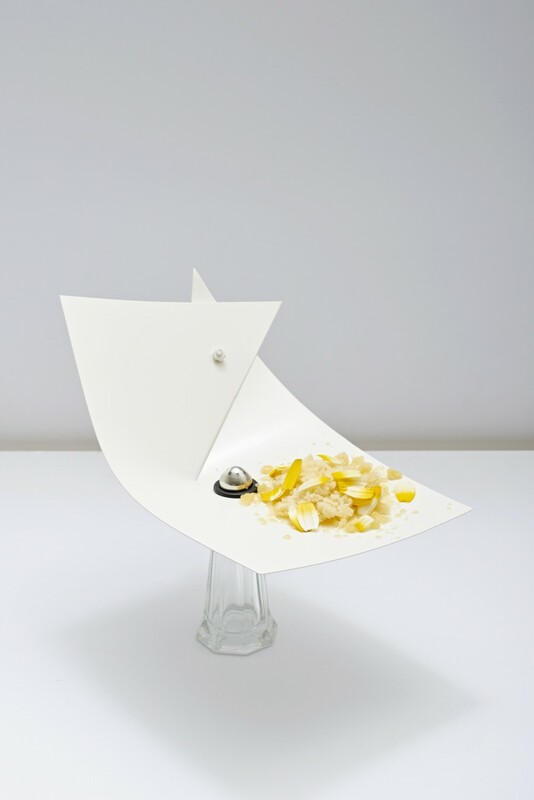 ‘Fruit’ from Daniel Burns (Luksus) served on a ‘White Snip’ plate by Kathleen Reilly. 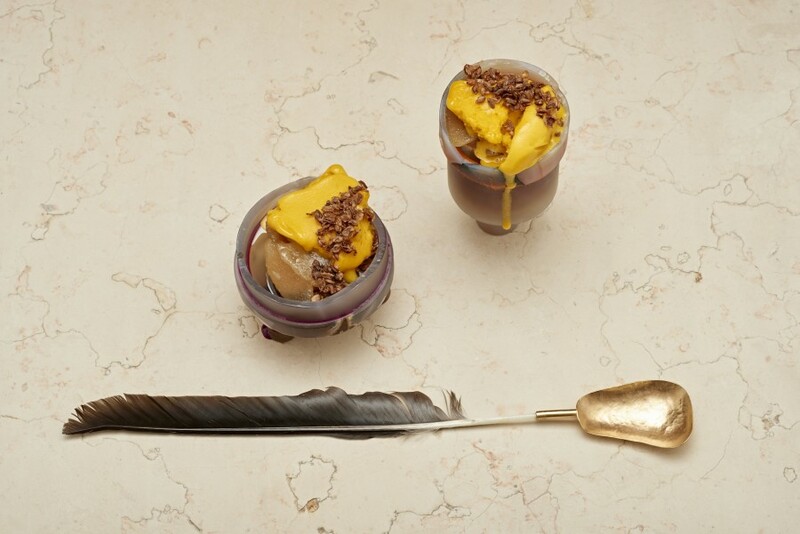 ‘Orchard’ from Daniel Burns (Luksus) served on ‘Scenic Lookout’ plates by Julia Obermaier with a feather spoon by Elin Flognman. Photography by Rein Janssen.